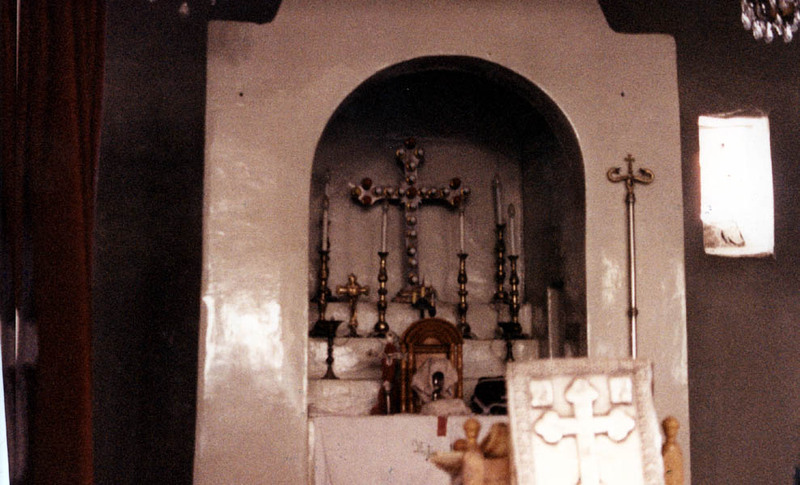 Students and three professors (Michael Fuller, Neathery Fuller and David Hanlon) from St. Louis Community College visited the church of the Holy Virgin in the town of Al Malikiyah on 22 June 1990. This community is situated in the most Northeastern corner of Syria and includes 5 churches, 3 mosques, and 1 monastery. Some people call Malikiyah by its ancient name of Dierkh. Exterior view of the Church of al-Adhra "Holy Virgin." This church was a buried ruin for centuries. The members of the Syriac Orthodox Church restored the building even though it does not perfectly fit into the planned design for the nearby street. The interior of the church measures 11.3 meters long by 7.2 meters wide. 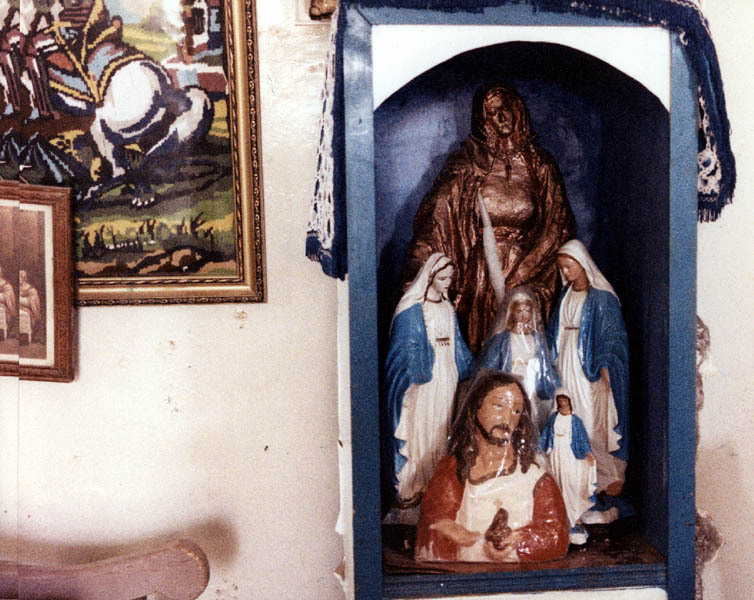 The local Syriac Orthodox Community reports that a vision of the Virgin Mary appeared in this sanctuary on 12 June 1960. The vision was seen near the Methbah (Syriac, altar) of the church. Shortly after, the members realized that drops of oil were forming on the wall next to where the vision had been seen. Terms given by the community for the various features in the church. Doorway into the church and the local caretaker. Abouna Louise (Syriac Orthodox Priest) was born in Malikiyah; he offers a prayer with Saiday Affram Abdulahad.. Altar inside of the Church of Virgin Mary. 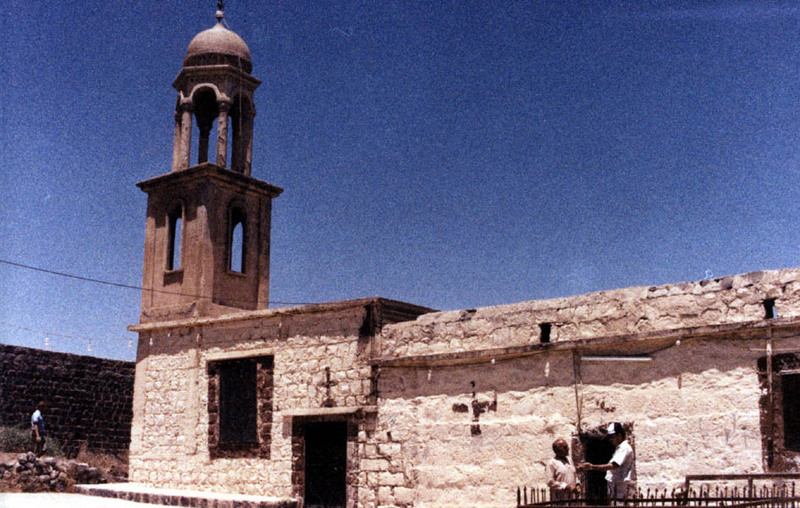 The municipal government of Malikiyah issued an order to close the church in 1961 because it extended into the street. The local congregation did not want it closed and demolished because of the vision and the miraculous presence of the oil. The town officials removed all drops of oil from the wall, then sealed the door for one week. There was plenty of oil drops on the wall when the door was unsealed. The drops of oil are protected by a plexiglass box built by a policeman from Dara. He built the box because he was instructed to do so in a dream. The health of his sick son improved after he had constructed the box. Icons of the Virgin Mary and Christ child inside of the church. Detail of the face of the Virgin Mary and Christ child. Another icon on the wall of the church. Statuettes of the Virgin Mary and Christ in a small niche in the wall of the church. Saiday Affram Abdulahad, as a young bride she would take sheep to graze and pass the place of the ruined church. She would often see a man dressed in white and holding a candle. She told her husband that he must be a saint. 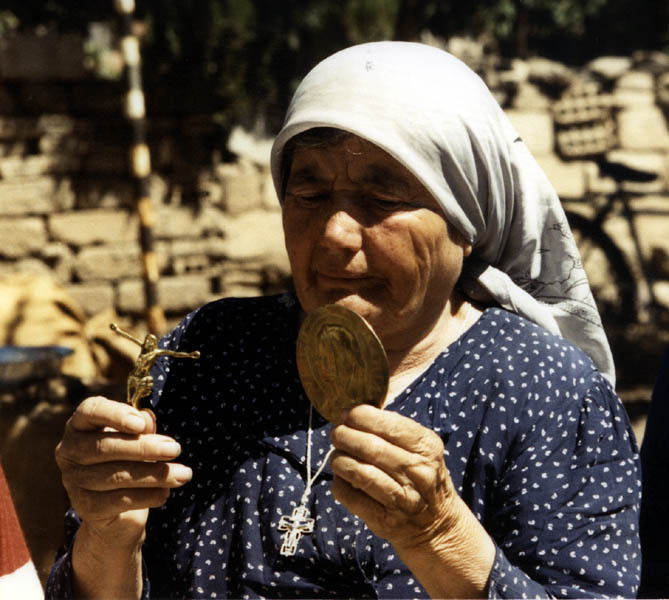 She dreamed of the Virgin Mary who told her to dig in the ruins to reveal the ancient church. Her husband discouraged Saidiayah because their family was poor. She told a priest of her visions and dreams. In another dream - the Virgin Mary showed her the place and said "I am the Virgin Mary and this is my church." The Virgin told her to light a candle each Sunday." Saidiyah wanted others to believe her and asked the Virgin for proof. On night, at midnight during the winter, there was a knock on the door of her house. A woman at the door identified herself as a midwife and asked for Saidiyah's help with a birth. They walked together and came to the place of the ruined church. The midwife stopped and said, "Now, I will give you the evidence of the truth." The midwife drew with chalk, a circle on the ground. She said, "Here you will find an image of the Virgin Mary and a cross." Saidiyah told these things to the local priest. He did not believe her. Others in town were curious, so they found the chalk circle and excavated down one meter. An image of the Virgin and a small metal cross were the reward for the effort. The local Christians constructed a mudbrick church on top of the ruined foundations of the older church. The walls have been concreted but the floor remains basalt flagstones. The apparitions of the Virgin Mary began to appear inside the church. Sometimes the curtains of the haikal (Syriac, temple / Holy of Holies) would open or close by themselves. Sometimes a man drapped in white would appear, but vanish when you approached him. Sometimes a dog would float through the air in the sanctuary. Today, the church is within a Kurdish speaking neighborhood. Once, a man from the neighborhood walked past the church and swore a curse against the Virgin Mary. His mouth became twisted upon his face. He begged the priest for a healing. The priest told him to make an offering the Virgin. He did as instructed and he was healed. An apparition of the Virgin Mary was witnessed on 12 June 1960. The Virgin Mary was seen carrying baby Jesus by several men, women, girls and boys. Those who saw the miracle included Syriac Christians, Armenean Christians and Muslims. The apparition reappeared on 16 July 1960. The church is not often open for lack of a priest. [Anthropologist note: the stories that I report were translated into English (from Syraic and Arabic) by a sworn English translator who had accompanied us to visit the remarkable churches in Malikiyah. Color photographs by Professor Neathery Batsell Fuller and black-and-white photographs by Professor David Hanlon. Personal note: a small vial of the oil from this church was given to Professors Fuller as we expressed desired to have children. Our Syriac Orthodox friends gladly attribute the birth of our daughter to the miraculous power of the oil from this church.